First, it is worth reviewing the situation we find ourselves in. Electric power worldwide is over 40% of total global carbon dioxide releases, and it is the fastest growing portion (in terms of humanreleased greenhouse gases). India, China, and other countries are rapidly industrializing and bringing basic electric power services to their peoples. 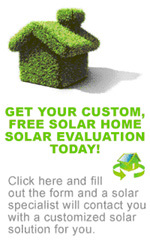 Their development, like US electric power, follows the perceived least-cost options. Unfortunately, coal-fired power plants are by far our most destructive and dangerous ones - coal burning directly kills millions of people worldwide in particulate, sulfate and mercury releases, and emits over twice as much CO2 per KWh as any other form of power generation. Nevertheless, US utilities are planning to build more than 150 new coalfired power plants in the US over the next 5 years, and China is building roughly 60 large plants every year. Electric power is an engine of economic growth, bringing light, cooling, and communication to billions, but every coal-fired power plant is a ticking problem. In this paper, we will address the arguments for coal power as well as other conventional energy sources  and discuss the cheaper, cleaner, and scalable alternative energy sources that can meet our power generation needs. backup/reserve power) and limit wind from serving as a base-load power source. The Energy Information Administration predicts that coal consumption worldwide will nearly double from 2003 to 2030. In the same period, coals share of world energy consumption is likely to grow from 24% to 27%.Total coal reserves are estimated at 1,001 billion tons - or about 180 years at current consumption levels (based on IEO2006 reference case, and assuming a 2.0% growth rate after 2030). The US has the worlds largest coal reserves, of approximately 270.7 billion tons. The EIAs outlook suggests that from 2003 to 2030, coals share of electricity generation in the US will rise from 51% to 57%. As a result (despite the large reserves), the EIA notes that the US is a net importer of coal today2. Total coal consumption in the US is expected to rise from 22.9 quadrillion Btu in 2005 to 34.1 quadrillion Btu in 2030. Across the world, India and China are expected to see their coal consumption rise to 3.6 billion tons in the period and both are expected to become net importers of coal by 2030 (India is already an importer). In summary, we seem to have enough coal for a while - and the rapid growth of its usage in the US coupled with the growth of India and China suggests that coal will increase its role as a major factor in worldwide energy production, unless coal becomes uneconomic because of other factors. Or at least that is what conventional wisdom would say. Will it really? Are there any economic alternatives? And should it? Polluting and damaging to the land Coal is like fast food. Its cheap, plentiful, and relatively accessible for everyone. Unfortunately, it causes significant pollution, as well as extensive land and water damage. By all accounts, coal is a significant and persistent pollutant for the earths atmosphere. The EIA notes that Coal has the highest carbon intensity among fossil fuels, resulting in coal-fired plants having the highest output rate of CO2 per kilowatt-hour3 In 2004, Coal was responsible for 50% of the electricity generated in the United States but produced roughly 83% of the resulting Carbon Dioxide emissions from electric power generation. On a larger scale, coal is responsible for 32% of total energy-related US Carbon Dioxide emissions (as opposed to 32.7% from transportation). 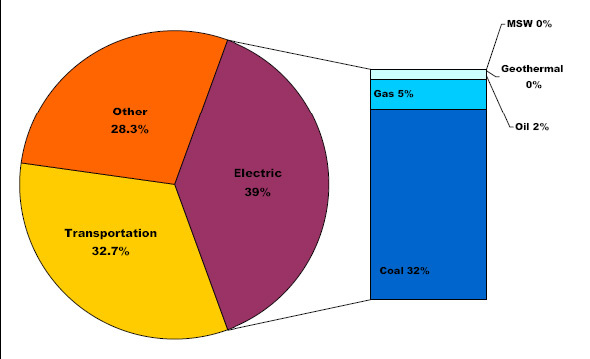 In essence, coal plants are responsible for as much CO2 emissions as every car/truck/plane/train in the US, combined. The EIA estimates above suggest that coals carbon emissions are expected to rise from 2,115 million metric tons of CO2 to 3,206 by 2030  an increase of approximately 50%. On a smaller scale, the Union of Concerned Scientists (UCS) notes that one 500 MW coal plant is responsible for as much emissions as 600,000 cars (and we have a 150 new plants planned!).  3,700,000 tons of carbon dioxide (CO2), the primary human cause of global warming--as much carbon dioxide as cutting down 100 million trees.  10,000 tons of sulfur dioxide (SO2), which causes acid rain that damages forests, lakes, and buildings, and forms small airborne particles that can penetrate deep into lungs.  500 tons of small airborne particles, which can cause chronic bronchitis, aggravated asthma, and premature death, as well as haze obstructing visibility.  10,200 tons of nitrogen oxide (NOx), as much as would be emitted by half a million latemodel cars. NOx leads to formation of ozone (smog) which inflames the lungs, burning through lung tissue making people more susceptible to respiratory illness.  720 tons of carbon monoxide (CO), which causes headaches and place additional stress on people with heart disease.  220 tons of hydrocarbons, volatile organic compounds (VOC), which form ozone.  170 pounds of mercury, where just 1/70th of a teaspoon deposited on a 25-acre lake can make the fish unsafe to eat.  225 pounds of arsenic, which will cause cancer in one out of 100 people who drink water containing 50 parts per billion. The cost of coal is felt directly on our health as well. The American Lung Association notes that a 2004 study attributed 24,000 premature deaths each year due to power plant pollution. In addition, the ALA notes that research estimates over 550,000 asthma attacks, 38,000 heart attacks and 12,000 hospital admissions are caused annually by power plant pollution.11 In the last century, more than a 100,000 deaths have been a result of mining, with over 200,000 black lung deaths. This is part of the burden of coal. As a result of these circumstances, conventional wisdom predicts the likelihood of a new coal rush today  the National Energy Technology Laboratory (NETL) reports that there are 151 new coal plant proposals (including 9 on-hold and 10 operational plants), that would generate 90GW in new coal power with a capital investment of $145 billion. Some perceive this as a problem we see an opportunity to solve the coal problem with better alternatives. We are likely to have a significant increase in the usage of coal as a resource unless we take action  now. If we fully take into the risks and likely (full) costs of coal, this rush to coal can be changed. With a proper assessment of the risks and full accounting, renewable power sources are likely to be cheaper and more attractive.